Does Facebook leak what profiles you click on? Now say you have a friend named Bob. Type ‘Bob’ in the box at the top of Preview My Profile to see how your profile will be seen by him. Take a look at the Mutual Friends section (bottom left in the screenshot above) of your profile (from Bob’s view – so still in Preview My Profile). Notice how these mutual friends seem to bias towards those who are closest to Bob (and perhaps to you as well). This by itself is pretty interesting. I can see who my friends are closer to relative to our other mutual friends. This pattern seems to hold up well in my trials over my friends who I know well (I saw that their closest friends were popping up more often than not in the mutual friends section). This got me curious about how Facebook determines “closeness” between two people. In particular, does Facebook leverage your clicks on a friend’s profile in determining how close you are to that friend? To experiment, I frequently clicked on my friend’s (say her name is Alice) profile and newsfeed updates over two weeks. She’s someone I rarely communicate with. I then normally browsed profiles of mutual friends I share with Alice and noticed that in the mutual friends section of those profiles Alice frequently showed up (even when the total number of mutual friends was greater than 80 – keep in mind that the mutual friends section only shows 3 friends). Now, there’s definitely randomness at times and I believe multiple ranking features are probably being used here (like perhaps number of exchanged messages) but I have a feeling clicks might be in play here as well based on this result. 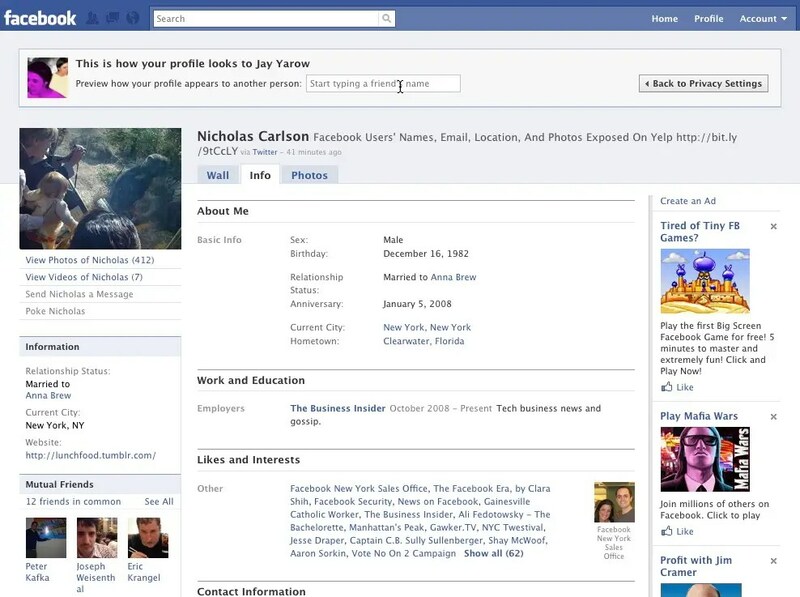 If Preview My Profile gives you the same view over mutual friends as what you see normally when you click on a friend’s profile, and if mutual friends uses private information like clicks / messages as features in the ranking, then it may be possible to infer who your friends are communicating with or clicking on more – or at the very least, find who they are closer to relative to your other mutual friends. If I view my profile from Bob’s eyes and frequently see Alice appear in the Mutual Friends section over multiple runs it may imply a strong relationship from Bob to Alice. Also, when the number of mutual friends is high relative to the number of total friends your friend has, then this result may be even more accurate.